Clematis, that is. Back in May I did a short post about it here. I promised I would post an update on its performance, so here 'tis. I paid a whopping $26 for it and I must say I'm a little disappointed. But then again, with a little more time I expect to see a much better show in the years to come. My front yard is deep and this arbor is situated quite far from my front entry. I'd prefer something with more impact, and viewable from the street and my walkway so that I can enjoy it more while coming and going. I'm thinking maybe a climbing rose, but I don't want something that will swallow up my lovely arbor. Do you have a favorite climbing rose or other vine that you might suggest? 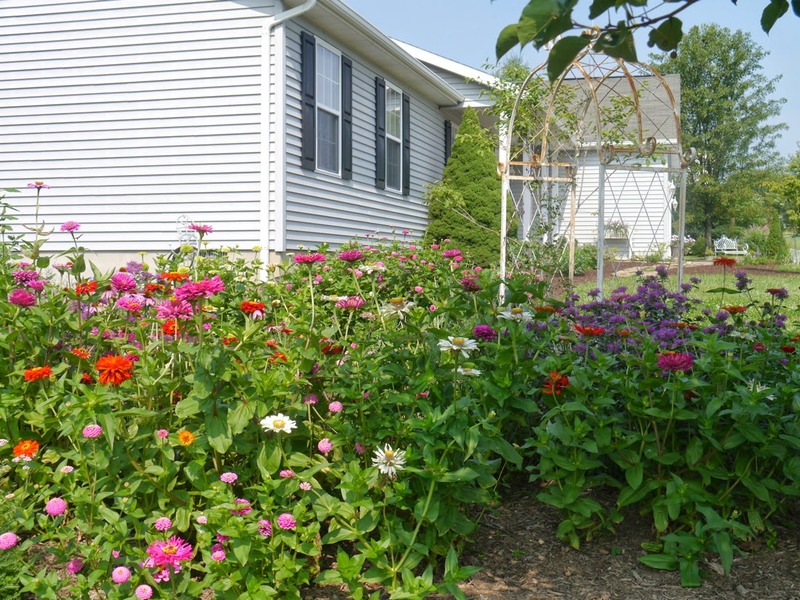 Here is what that garden looks like now, in late July. Its a new garden and you can read more about it here. The perennials I transplanted there are going great guns right now, as are the zinnias. Thanks to Mother Nature and her fabulous rains and unusually low temperatures this summer, gardening has been even more of a pleasure this year! What a difference a few months can bring! This was my cutting garden in late May. You can see the new clematis quickly growing up the right side of the arbor. I need something that blooms with those tall Gladiator Allium - to hide their ugly foliage! I intend to divide and transplant some tall bearded iris there very soon. Now is the time of year to do that, you know. Hoping that will do the trick. I think a vine on the arbor that blooms in early summer would be nice. 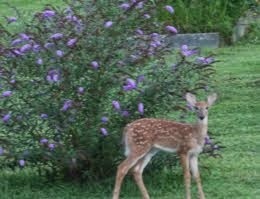 You know, in early June after the spring flush of bloom is past. I really think I'll move the 'Sweet Summer Love' clematis to my back deck. Maybe it could make friends with this Jackmani. I kinda like purple, can you tell? 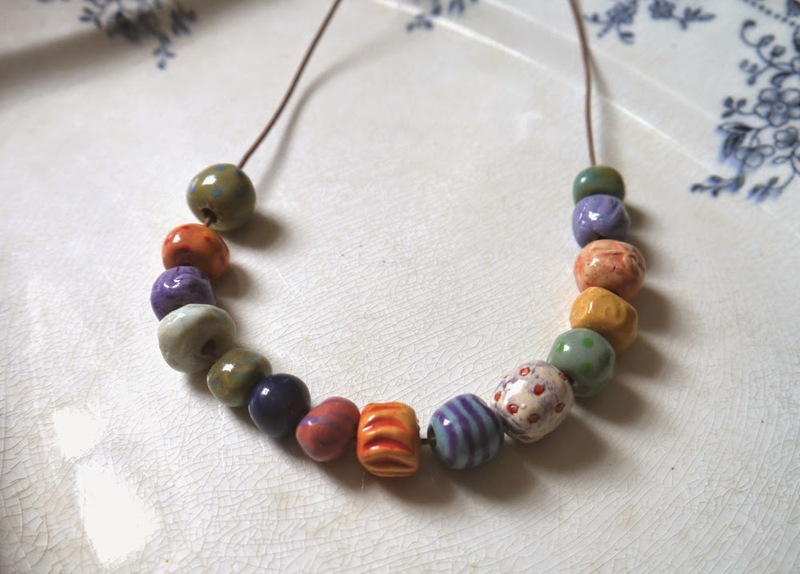 Actually, I like all colors, especially if they are bright and cheerful like these new beads I'm now making for my Etsy shop! 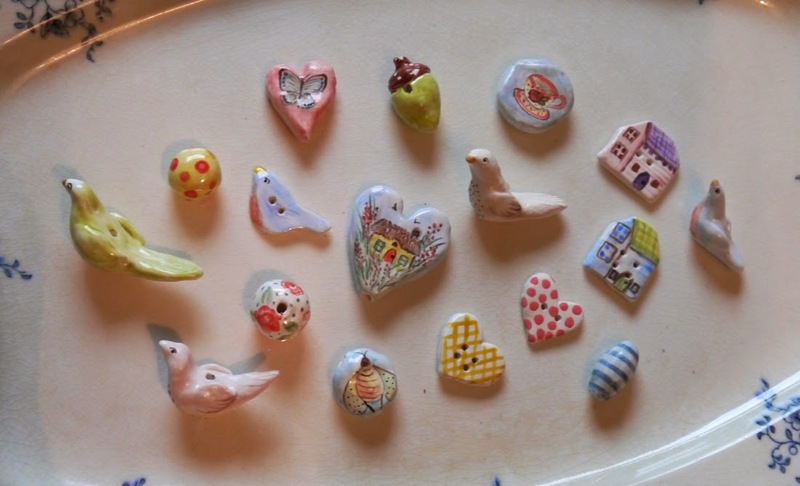 I've recently began creating lots of new buttons, beads and pendants for you to include in your own creative projects! I am having so much fun making these! 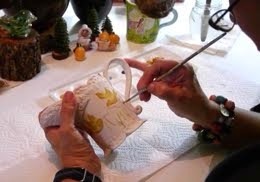 I listen to audio books by British authors on Librivox.org while creating my pottery, which really seems to take me to the English cottage gardens of my dreams. Especially if the reader is British, too! Right now I'm listing to "Cranford" by Elizabeth Gaskell, one of my very favorite 19th century British authors. 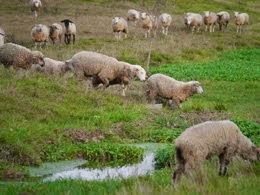 NOTE: You may have noticed I have made my blog wider and my photos are larger. Please let me know if you are having problems viewing my blog properly. I tried to choose a size to target most technology, but I'm not very technical so it will be interesting to see if my new size was a good idea or not! 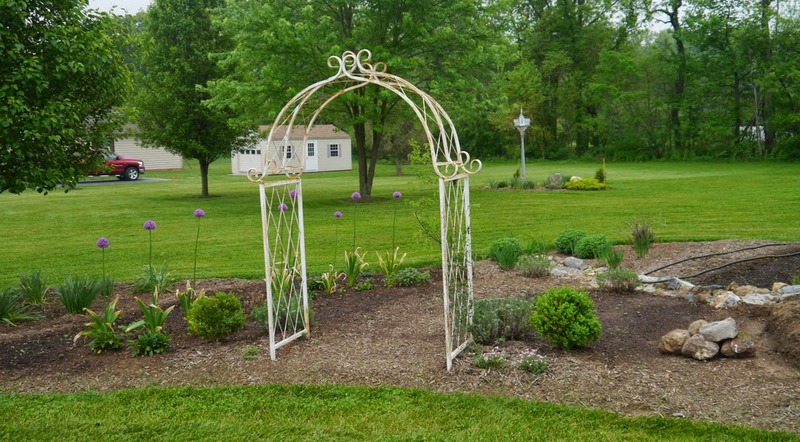 I 'love' your garden filled with colorful, happy blooms and your iron arched arbor is fantastic. I bet in time the clematis will do nicely there, it is after all, just newly planted. 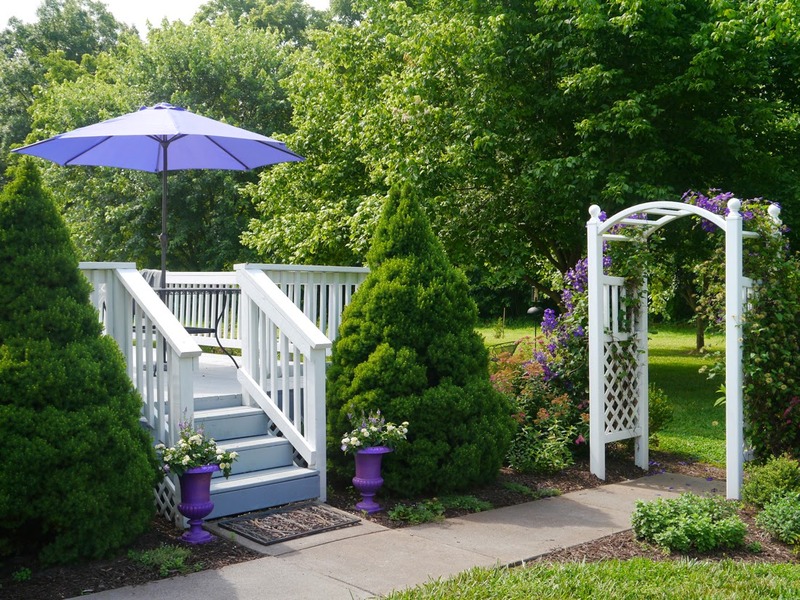 I love the arbor by your back deck and your purple planters too. 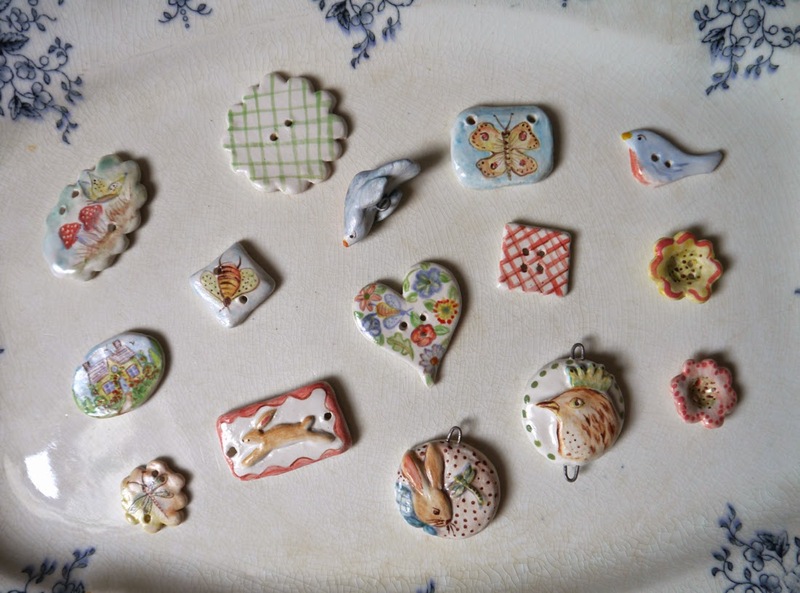 Your buttons and other small creations are just wonderful!!! Your work makes me feel happy. When I read about you creating to LibriVox, I looked them up and started listening to a book while I embroidered. I am hooked on this now. Thank you for sharing that tidbit. Aww, thanks ladies. Rainey, I'm hooked on Librivox now too! Glad you're enjoying it! 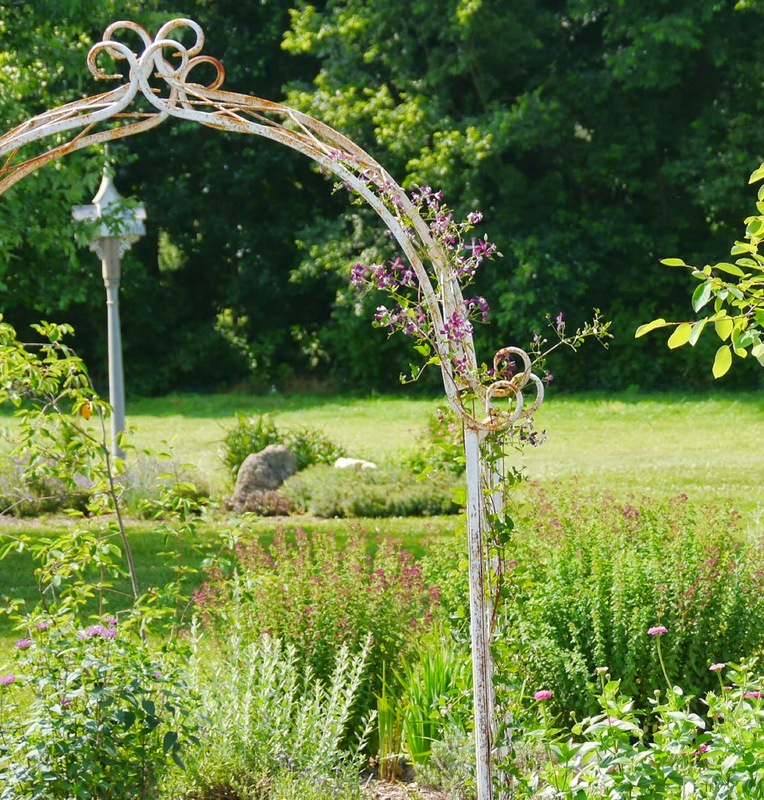 What a beautiful cutting garden! I just stopped by to visit from Sew and Sow Farms. I love your page. Beautiful garden i have Sweet Autumn Clematis that allow to take over the yard from now until October when it rewards me with the lovely scent and drifts of white flowers. The old adage about clematis I have found to be true: first year it sleeps, the second year it creeps, and the third year it leaps. trumpet vines on two others. They do take over the arbor. Darling little buttons you created. Happy Friday. I have arbor envy! It's a wonderful piece of garden art! Your jack (I forget already!) clematis is to die for and your cutting garden is lovely. You've done a great job on your yard. Now, to sit and have a cold drink while admiring your work! Oh wow! 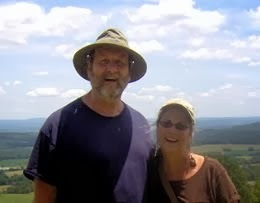 First time visitor to your blog, but not my last! Gorgeous garden! And your deck! Fantastic! Love the purple! 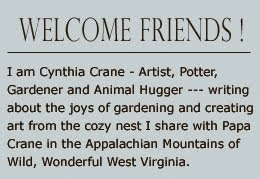 I found your blog from pinterest and have fallen inlove with all the pictures of gardens and flowers that you post. I am growing a wall of morning glories outside of my daughters balcony and find a lot of inspiration from your page :) I will post up some before and after images as soon as the start growing..
Are you interested in exchanging links with my blog? Hi Cynthia, your garden is beautiful. 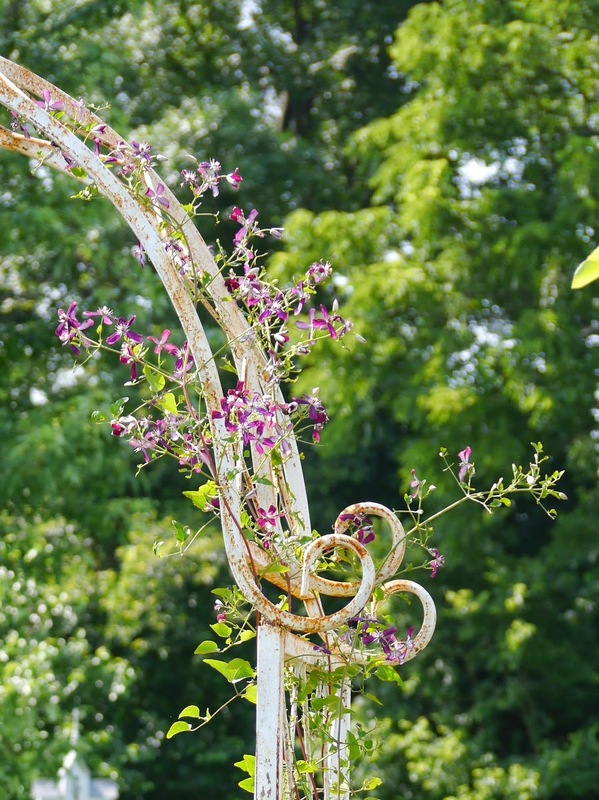 Love the elegant iron arbor and the delicate clematis. I'm sure it will thrive there. 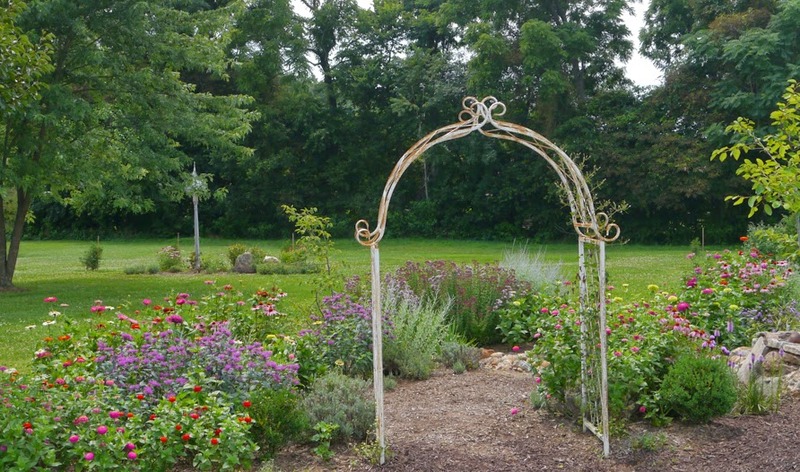 Your cutting garden underwent an amazing transformation in just those few months. Isn't it lovely when all your hard work is rewarded by lots of beautiful flowers? Pretty, pretty, pretty! 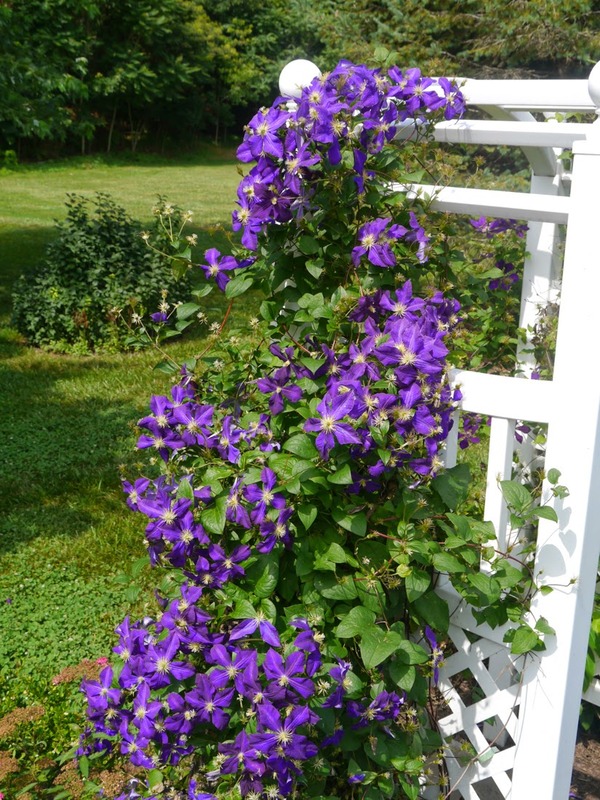 The Jackmani is my favorite clematis. 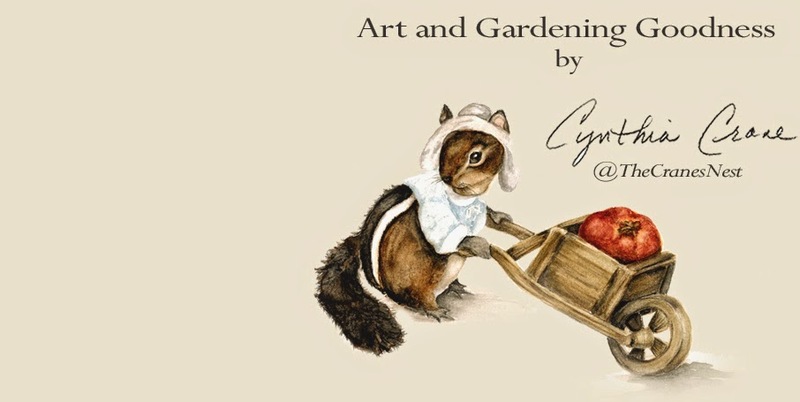 Wonderful garden and artistic delights here, Cynthia!